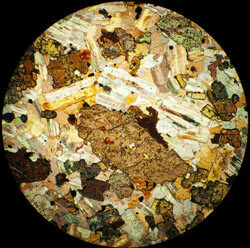 Pacific Rim Geological Consulting Inc.
examination of Ni-CU-PGE prospects in Kamchatka. Pacific Rim Geological Consulting, Inc. (PRGCI) is an Alaska S Corporation based in Fairbanks. 2012 marked PRGCI's 15th year of participation in Alaska's minerals industry and geotechnical community. The corporation's principle goal is to provide high quality geological consulting for a wide variety of private and public sector clients in Alaska, NW Canada, and Eastern Russia. 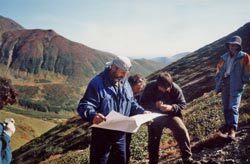 For twenty-five years, PRGCI President Tom Bundtzen worked for the Alaska Department of Natural Resources, where he completed geological mapping assignments, mineral industry surveys, and applied research projects aimed at identifying lands for State selection for transportation infrastructure. PRGCI is a small company with few permanent employees. PRGCI gathers geotechnical information, verifies discoveries, and solves geotechnical problems for a variety of clients. PRGCI builds programs around what is needed by the client through deployment of PRGCI employees and sub-contractual personnel that can meet those specific technical requirements. 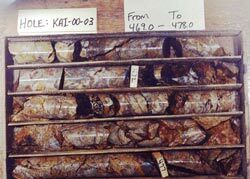 What PRGCI brings to the table is a variety of expertise for client needs such as bedrock and surficial geological mapping, claim staking, permit review and analysis, independent review of company programs, exploration of metallic and non-metallic resources, and petrographic and other lab-based expertise. Our client lists include not only larger corporations and smaller mining and exploration firms, sand and gravel and rock quarry companies and government agencies in need of quality, applied geological information. PRGCI has completed contractual work with the U.S. Geological Survey that helped create and establish the Alaska Resource Data Files (ARDF) for key quadrangles in southwest Alaska. PRGCI has also contributed geological mapping expertise to several Federal projects in western and southwestern Alaska. Geochemical sampling programs are specifically designed for client needs, and include standard elemental suites for rock, soil, stream sediment, and panned concentrate sites used in mineral exploration, acid-base accounting work for evaluation and deployment of CaCO3 resources, and environmental baseline studies for those evaluating a property for development. PRGCI takes advantage of publicly-accessible facilities such as the campus of the University of Alaska-Fairbanks (UAF), geo-technical and land status information from divisions of the Alaska Department of Natural Resources, and from federal agencies; i.e., the U.S. Bureau of Land Management. Radiometric age dates have been acquired through contract with the UAF 40Ar/39Ar dating facility and other isotopic laboratories nation-wide. Private laboratories specializing in electron microprobe services such as Cannon Microprobe Inc. of Seattle, WA are also utilized. Logistical capabilities are enhanced through sub-contractual arrangements with nationally known analytical and materials labs, which maintain prep-labs, and assay capabilities from facilities in Fairbanks. Highly reputable logistical firms such as Fairbanks-based Taiga Ventures have provided services to PRGCI for client needs. PRGCI maintains a large library of reference materials, rock sawing abilities, and rock and has sample storage handling capabilities. PRGCI also stores (and can store) selected rock core for clients. During the last several years, PRGCI has worked on transportation infrastructure projects. One such study involves an analysis of mineral resources along the proposed Alaska-Canada railroad extension. During 2010, PRRCI investigated ballast and riprap sites along a proposed railroad extension from Dunbar siding near Nenana to Livengood. PRGCI offices are located at 4868 Old Airport Road in Fairbanks, about 2 miles (3 km) from the Fairbanks International Airport. Both fixed wing and helicopter firms are located near our offices in Fairbanks.